On most Friday nights around 8 p.m., Nicole "Nikki" Davis sets up shop at Smelly Cat Coffee in NoDa. On her table are large glass jars filled with specimens that look better suited for a laboratory than the local coffee spot. Jellyfish-like cultures float in a brownish liquid, as Davis talks with enthusiastic people who want what she's offering. For those in the know, Davis is the Kombucha Lady, a local blogger, fermentation enthusiast and part of a burgeoning group of at-home 'booch brewers in Charlotte. 'Booch, short for kombucha (pronounced "kom-BOO-cha"), is a fermented tea beverage that traces its history back to ancient China, where it was called the "Tea of Immortality." Fizzy, tart and whimsically flavored, the tonic is said to possess healthful probiotic properties that have made it popular across generations and cultures for thousands of years. The kombucha craze seems to be bubbling into the mainstream in Charlotte. While Hollywood celebrities have been secretly sharing kombucha cultures since the early '90s, in more recent years there's been an upswing in the tea's popularity across the nation. Photographs of Madonna, Halle Berry and Gwyneth Paltrow sipping 'booch have appeared in entertainment news outlets, and commercial brands like GT, Synergy and Vibranz are available on shelves everywhere from Whole Foods to the locally owned Common Market in Plaza Midwood and South End. But while advocates swear by kombucha's benefits, health professionals remain skeptical, and some even warn of relatively mild dangers including upset stomach and allergic reactions. Such warnings haven't deterred kombucha believers. "My aunt used to make it," says Davis. "I remember her giving me this weird, vinegary stuff to drink." It wasn't until a year ago, however, that Davis ventured into the world of 'booch brewing herself. A friend had mailed her a symbiotic culture of bacteria and yeast (or SCOBY), the gelatinous pancake that's central to kombucha brewing. 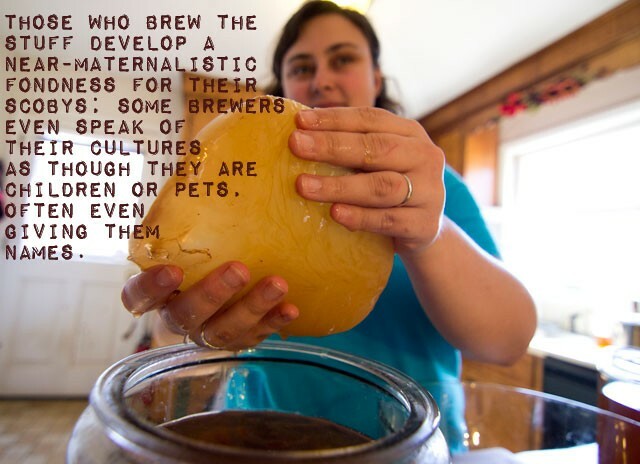 Those who brew the stuff develop a near-maternalistic fondness for their SCOBYs; some brewers even speak of their cultures as though they are children or pets, often even giving them names. Within months, Davis was brewing 'booch, experimenting with different flavors and blogging about her experiences. Today, her East Charlotte home is an elaborate set-up of gallon jars atop her kitchen counter, crates full of bottled kombucha (there were 62 bottles at the time of my visit) and three new 7-gallon containers, a Christmas gift from her husband. 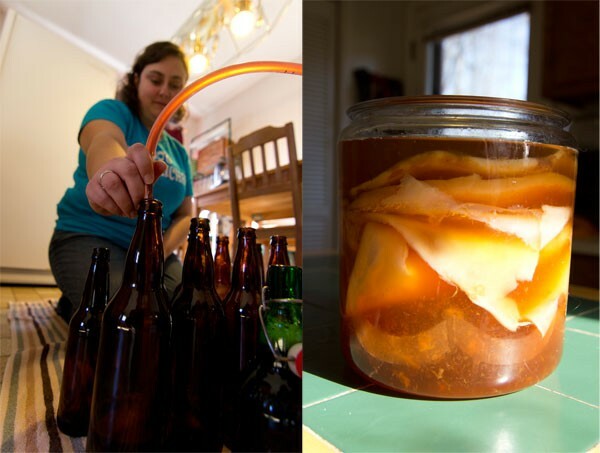 To make kombucha tea, a brewer places her SCOBY in a large vessel of sweet tea, typically green or black, which feeds the living culture. The brew then ferments over a period of days, usually 10 to 15. During the aerobic-brewing process, the SCOBY grows and multiplies, as living things tend to do, and the brewer is left with the offspring of its "mother" culture. Brewers typically share the offspring with other kombucha enthusiasts. 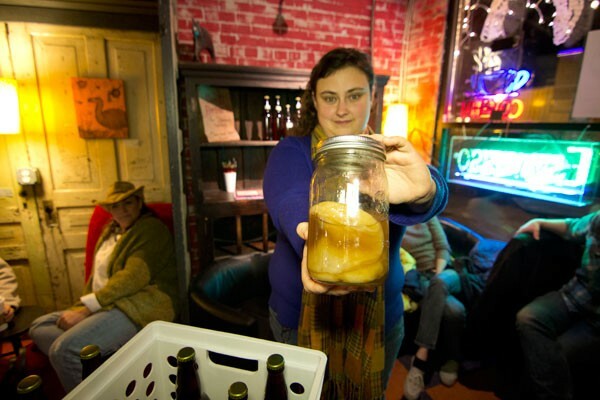 On the counter in Davis' home is what she calls her "SCOBY hotel," a one-gallon jar full of floating pancakes that she will soon distribute to fellow home brewers who have heard, by word of mouth or from Craigslist, that she's holding. Davis also is in the process of setting up an Etsy shop to sell her SCOBYs. "I always have a waiting list," Davis says. "I tell people, 'I'll be the weirdo with the glass jars on the table.'" Davis says the recipients of her SCOBYs are a mixed bag ranging from "hippies to burly tattooed guys." The age range, she says, is from 19 to 68. TWENTY MILES from Davis' home, South Charlotte couple Jake and Laura Watson are preparing a new batch of kombucha from one of Davis' great-grand cultures. "It was a big decision to start making it," says Jake Watson, who researched the hobby on websites such as the Healthy Home Economist and Kombucha Kamp before committing to the tasks of raising SCOBYs and home-brewing kombucha. "It's very much like bringing a pet home — you have to care for it," he says. "It's a living thing." The Watsons became interested when they realized how much they were spending on kombucha at stores. Commercial kombucha costs up to $4.50 a bottle, which can become a hefty price tag if you are drinking two to three a day, as Jake Watson does. He reaches into a coat closet and pulls out a large grocery bag full of glass bottles, evidence of his daily kombucha habit. The Watsons received their SCOBY six months ago from a friend who had acquired one from Davis. "It came in a gift bag that said 'Bella' on it," says Laura Watson. 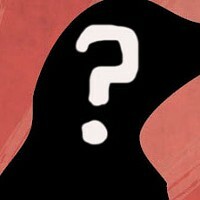 "The name stuck." The Watsons have lovingly welcomed "Bella the SCOBY" to the family and, like many 'booch brewers, quickly became obsessed with experimenting and caring for their rubbery offspring. 'Booch-brewing has scientific appeal, too. Fermentation requires knowledge of the aerobic (meaning "with oxygen") process of fermentation, which occurs when the SCOBY remains in contact with its sweet food source and breathable (or oxygenated) environment. The Watsons' tea and SCOBY are in a glass jar covered by a square cloth cut from a T-shirt and fastened with a rubber band. They say the fun is in experimenting with brew time, various vessels and different flavors. "I prefer a more vinegary taste," says Jake. "If you get burps from it, that's the best!" "That means you have fizz," adds Laura. They let me sample some of their original brew, which is tart with a kick. It puts a little fire in my belly, much like a shot of whiskey. Incidentally, kombucha produces little to no alcohol when brewed aerobically. Any alcohol produced is often compared to the sugar alcohols that develop in a glass of orange juice left on a counter for a day or two. 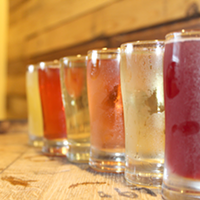 For most brewers, alcohol is a minimal concern and is not a goal when brewing kombucha. The Watsons also give me a taste of a more tropically inspired 'booch flavored with pineapples and raspberries. The tropical 'booch has only a whisper of fizz, which offers welcome refreshment. "It's a great alternative to soda and fruit juice," says Laura. That afternoon, I witness the Watson's first attempt at setting up a "SCOBY hotel," which ends with a reluctant decision to get rid of some of their offspring. "I don't feel right about [disposing of it]," says Laura. "We grew those." Bella the SCOBY had multiplied while the Watsons were out of town and they were unable to separate the individual offspring in time to propagate the new cultures properly. In short, says Jake, "We let her get fat. We have to let it go." IN DILWORTH, Ken Newbill, a systems engineer and recent transplant to the Charlotte area, has been brewing kombucha for two years. He meets me at Caribou Coffee, eager to offer samples of his personal brand, which he calls "Ken-bucha." Newbill's story is similar to those of the other brewers. He met a brewer through friends and was mailed a SCOBY along with a set of instructions. 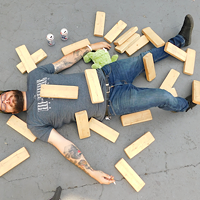 He was first introduced to 'booch culture online, where he connected with fellow brewers in California, New York, Virginia and Kansas. "We all took care of each other and shared ideas," Newbill says. He reaches into a small lunch cooler and pulls out a glass bottle filled with his mixed berry ginger kombucha. 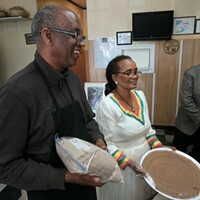 In the crowded coffee shop, Newbill whips out a mini-strainer and begins pouring his concoction into two solo cups, which he's brought along for the tasting. He meticulously strains the kombucha and points out the gentle carbonation, a key characteristic of good 'booch. "You see that fizz right there?" Newbill asks. "That's Ken-bucha, baby!" For some, the joy of the brewing process and SCOBY care surpasses the enjoyment of actually drinking the tea. "I like brewing because it's an experimental process with a finite end," Newbill says. "Like any micro-brew culture, everyone finds their own unique tastes, every brew is someone's personality." Townes Mozer, owner of Charlotte's only kombucha micro-brewery, Lenny Boy Kombucha, attests to the fermentation fanaticism brewers get. 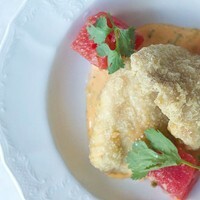 "You start out with a couple ingredients and it's a total metamorphosis. 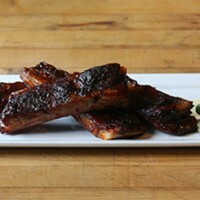 You can see it right before your eyes," Mozer says. Like the other brewers, Mozer was given a SCOBY by a friend who had been brewing out West. Mozer was shown the basics and then began researching on his own, reading books and later delving further into holistic herbalism. What began as small gallon batches grew into 10-gallon batches and bottling for friends. His largest at-home batch before he went commercial totaled 100 gallons. Besides the joy of fermentation, Mozer believes in kombucha's health benefits. Though no firm scientific evidence supports the health claims of kombucha, it is said that beneficial probiotics are derived from the fermentation process, a result of the bacteria and yeast converting sugar into organic acids. Probiotics promote healthy intestinal flora and many kombucha enthusiasts, like Mozer, report an overall sense of well-being. Newbill believes in the restorative properties of 'booch so much that he gives the tea to his 16-month-old son. Davis says that a man who drank her kombucha claims to have beaten the flu with it. Brent Bauer, M.D., an internal medicine specialist with the Mayo Clinic, has warned that none of these claims have been verified. "Health benefits attributed to kombucha tea include stimulating the immune system, preventing cancer, and improving digestion and liver function," Bauer writes. 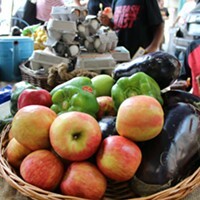 "However, there's no scientific evidence to support these health claims." In fact, he warns of "adverse effects such as stomach upset, infections and allergic reactions in kombucha tea drinkers. Kombucha tea is often brewed in homes under nonsterile conditions, making contamination likely." Local brewers stand by the benefits, their safe brewing processes and, perhaps mostly, the sense of community in 'booch culture. From the joys of brewing to the thrill of parenting SCOBYs, 'booch brewers find deeper meaning in their obsession: a chance to connect and share ideas makes kombucha more than just a case of drinking the kool-aid. These folks are literally spreading their seeds. Davis excitedly announces that she'll be meeting a woman from Virginia in the coming week. She smiles, adding, "So now I'll be populating Virginia Beach with my SCOBYs!"